The Rook (Corvus frugilegus) is a member of the passerine order of birds and the crow family. The species name frugilegus is Latin for "food-gathering". This species is similar in size (45–47 cm in length) or slightly smaller than the Carrion Crow with black feathers often showing a blue or bluish-purple sheen in bright sunlight. The feathers on the head, neck and shoulders are particularly dense and silky. The legs and feet are black and the bill grey-black. Rooks are distinguished from similar members of the crow family by the bare grey-white skin around the base of the adult's bill in front of the eyes. The feathering around the legs also look shaggier and laxer than the congeneric Carrion Crow. The juvenile is superficially more similar to the Crow because it lacks the bare patch at the base of the bill, but it loses the facial feathers after about six months. Though resident in Great Britain and much of north and central Europe, vagrant to Iceland and northern Scandinavia, it also occurs as an eastern race in Asia where it differs in being very slightly smaller on average, and having a somewhat more fully feathered face. In the north of its range the species has a tendency to move south during autumn though more southern populations are apt to range sporadically also. The bird has been introduced to New Zealand though it is very localised. It is considered a pest there and it is being eradicated. Food is predominantly earthworms and insect larvae, which the bird finds by probing the ground with its strong bill. It also eats cultivated cereal grain, smaller amounts of fruit, small mammals such as voles, acorns and the eggs of ground-nesting birds. In urban sites, human food scraps are taken from rubbish dumps and streets, usually in the early hours when it is relatively quiet. It has also been seen along the seashore, feeding on insects, crustaceans and suitable food flotsam. Nesting is always colonial, usually in the very tops of the trees. Branches and twigs are broken off trees (very rarely picked up off the ground), though as many are likely to be stolen from nearby nests as are collected from trees. Eggs are usually 3–5 in number, can appear by the end of February or early March and are incubated for 16–18 days. Both adults feed the young, which are fledged by the 32nd or 33rd day. In autumn, the young birds of the summer collect together with unpaired birds of previous seasons into large flocks. It is during the autumn that spectacular aerial displays can be seen by adult birds that seem to delight in the autumn gales. The voice, though similar to that of the Carrion Crow, is usually described as a "kaah-kaah-kaah" while the bird fans its tail and bows on each caw. Solitary birds often "sing" apparently to themselves uttering strange clicks, wheezes and almost human sounding notes. Like many other members of the Corvidae family, the rook features prominently in folklore. Traditionally, rooks are said to be able to forecast weather and to sense the approach of death. If a rookery — the colonial nesting area of rooks — were to be abandoned, it is said bring bad fortune for the family that owned the land. Another folktale holds that rooks are responsible for escorting the souls of the virtuous dead to heaven. William Butler Yeats may be making reference to the latter tale in his poem The Cold Heaven. 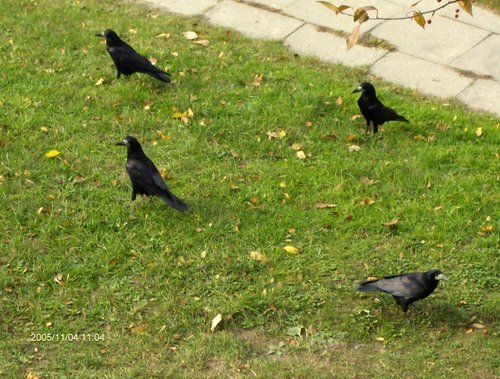 The literary term coined to describe a group of rooks is "a parliament".